It took 30 years for the British state to tame, first the Civil Rights Movement and then the Republican Movement in the Six Counties. By 1998, the British ruling class had come up with the Good Friday Agreement, as its central pillar in asserting its political and economic control over these islands. This was supplemented by Devolution-all-round. This strategy was designed to sideline the challenges they had faced from national democratic movements in these islands. One of those challenges began 25 years go when Thatcher attempted to impose the Poll Tax a year earlier in Scotland. Unwittingly, she opened up a second front in the challenge to the UK state. Those of us in Scotland, who joined that first Connolly March in 1993, came from that Anti-Poll Tax Movement. We are and remain socialist republicans. The British ruling class has for now derailed that republican challenge in Ireland. 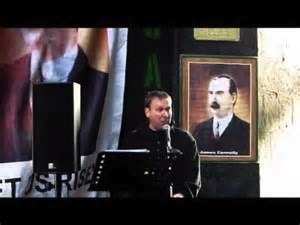 Mainstream republicans have become constitutional nationalists, more concerned with advancing the interests of middle class Nationalists within the existing ‘Six Counties’, than uniting all workers living in Ireland on a republican basis – Catholic, Protestant and Dissenter, and to which today we can add Polish, Spanish, Chinese and Nigerian. Republicanism, however, always arises anew. Your campaign to champion a widely celebrated Republic Day, and the campaign for a 32 Counties people’s referendum, marks the return of republicanism to the ‘People of No Property’. 20 years after that first Connolly March, you have new political allies. The UK is once more threatened with the possibility of break-up, with the issue of Scottish self-determination moving to the fore. However, there are two very different visions of Scotland involved in this. There is the nationalism of the SNP. This nationalism wants to create a Scotland for a new Scottish wannabe ruling class, and strike a new deal with the UK and with US imperialism. This is why they want hold on to so much of the British state machine, fronted by ‘Elizabrit’, and to remain in NATO. And continuing that long-standing British legacy, the SNP government is still targeting the Irish community in Scotland. Under the pretence of dealing with ‘anti-sectarianism’, their Offensive Behaviour Act, enforced by a new centralised Scottish police force – a ‘Scottish Met’ – is an example of anti-Irish racism. Meanwhile, the Orange Order announced yesterday that it would be throwing its weight behind saving the Union. I don’t know whether they will be getting a seat in the ‘Better Together’ campaign. However, there can be few objections, when this campaign is being bankrolled by Ian Taylor, who provided funds for a leader of the Serbian death squads. Connolly warned us of the dangers of a Unionist/Nationalist ‘Carnival of Reaction’ in the Home Rule campaign of 1912. We need to be alert to such dangers today. In opposition to the nationalists in the SNP leadership, the Radical Independence Campaign forms the republican wing of the campaign for Scottish self-determination – not ‘Independence-Lite’, but meaningful self-determination. We do not see a ‘Yes’ vote on September 18th, 2014, as the end of the struggle. We take heed of the words of James Connolly. Republicans in these islands need to unite on an ‘internationalism from below’ basis to achieve our ends. I very much hope that this Republican Day comes to be celebrated by republicans, not only in and from Ireland, but in Scotland, Wales and England too. 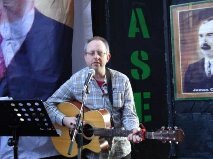 Gerry Mulvenna sang the song he had written 20 years earlier, Footsteps of James Connolly.